Korean chili powder is another spice I find myself reaching for more often these days, just another way to add some zip instead of the same old thing. You can find it at most bulk spice counters. 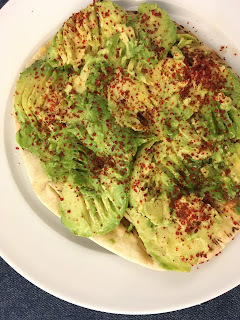 Try it on this simple but incredibly satisfying avocado toast and you’ll see what I’m talking about. If not, you can always use red pepper flakes or cayenne pepper. Scoop out a perfectly ripe avocado onto some toasted bread or pita and mash down gently with a fork. Drizzle with a little bit of extra virgin olive oil, sprinkle with some kosher salt and chili powder, and enjoy. Good right?